When you go away to college it seems like everything is new and exciting. Everything that is, except for your dorm room mattress. You can never be sure of what gross things are on your dorm mattress, but you can be sure that you don't want to touch it! 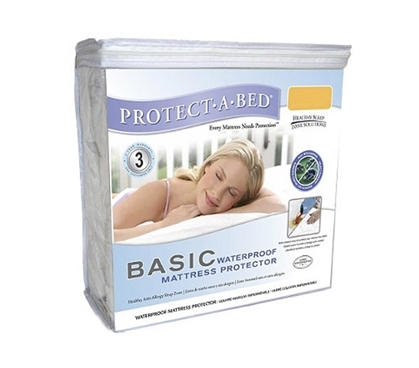 Our Basic Waterproof Mattress Protector will keep you away from allergens and dust mites that may be lurking on your dorm mattress. The dimensions of college beds are extra long, and super slim, so it can sometimes be hard to find dorm bedding. But that's not the case with our Protect-A-Bed mattress cover, because it's xl dimensions are just the right length and width to fit your dorm bed. Our dorm mattress is also 100% waterproof so you don't need to worry about spilling something on your mattress that would cause it to smell. Having all of your dorm bedding essentials is important, but having unique college supplies like this is what makes moving in such an easy transition. And if you're thinking that waterproof means comfort proof, think again! Just because our dorm mattress cover will keep you protected from gross dirt and stains, doesn't mean you'll be able to feel it on your college bed. Our dorm bedding cover is a completely useful, but also totally unnoticeable dorm room supply when it's on your bed. So if you're excited to have your own dorm room, but grossed out at sleeping on an old mattress, add our bedding cover to your college supplies and sleep germ free.